Prime Minister Tony Abbott has visited the bushfire stricken communities in the Adelaide Hills outlining disaster recovery and short-term income assistance payments to bushfire victims, but refusing to be drawn on whether climate change has influenced bushfires. I investigate some of the recent science into the links between bushfire and climate Change for South Australia and the climate of denial being put forward by the Abbott government. You can read a report of Abbott's visit to the fire ravaged area by Shalailah Medhora at the Guardian: Adelaide bushfires: PM announces cash payments for people left homeless. The Adelaide Hills Sampson Flat bushfire has burnt more than 12,000 hectares, with up to 38 houses and numerous sheds, livestock, including destroying the Tea Tree Gully Kennels and Cattery with the loss of life of many family pets. At the start of the fire on January 3 South Australian Country Fire Service state coordinator Brenton Eden warned on 891 ABC Adelaide conditions were as bad as the 1983 Ash Wednesday fires: "The Adelaide Hills are facing the worst fire conditions we've faced since Ash Wednesday." Temperatures in excess of Forty Degree Celsius plus 110km winds made it unsafe for fire fighters on the ground and water-bombing aircraft were also forced to remain grounded, leaving the fire to pick up speed and travel south largely uncontrolled. At One Tree Hill command centre in the Adelaide Hills the Prime Minister congratulated the firefighters for bringing the fire under control, “This has been a major incident. It’s now been running for the best part of the week. All of you have been flat out since Friday and you have responded magnificently to all the challenges that you have faced,” Abbott said. While he said it was a difficult time for those affected by the bushfire, and had a devastating impact on local communities, he refrained from linking the bushfires to climate change. If you remember back to October 2013 and the NSW early season bushfires Tony Abbott denied any link between bushfire and climate change, even accusing Head of the UNFCCC, Christiana Figueres of "talking through her hat" for connecting the NSW bushfires with climate change. "Every year we are going to face these extreme weather events, which are going to cost lives and infrastructure, and enough is enough. The Abbott Government has to stop climate denial and help to get the country prepared to adapt to the more extreme conditions." she said. "Look at what is happening to people, communities, our environment, loss of infrastructure and for goodness sake abandon your nonsense about climate variability. Accept global warming is real and let's get on with working together to plan for resilience in the face of extreme weather events." concluded Senator Milne. 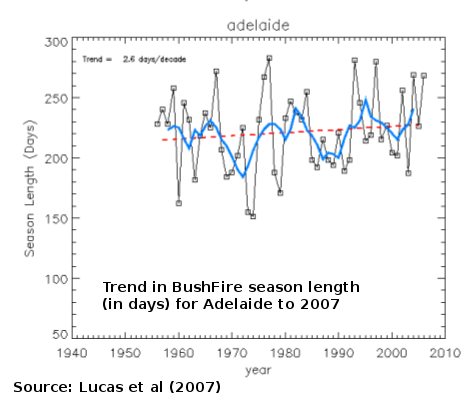 Is the long term climate trend influencing bushfire risk? 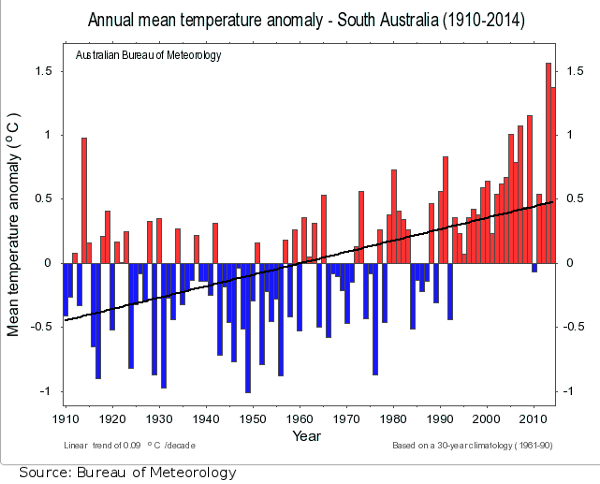 Let us look at some of the latest climate and bushfire related science. 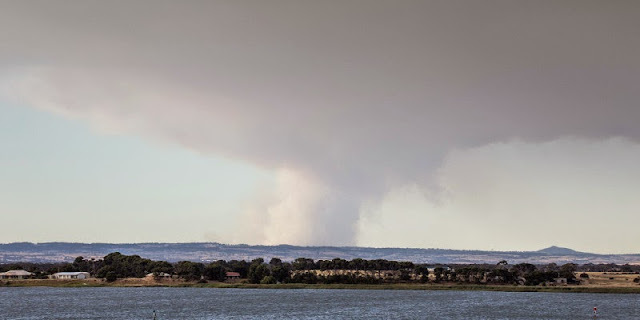 The Climate Council released a report on 4 November 2014 titled: Be Prepared: Climate Change and the South Australia Bushfire Threat written by Professor Lesley Hughes, which articulates that climate change is increasing fire danger weather and thus the risk of fires in South Australia. Bushfires are complex processes with multiple contributing causes revolving around ignition, fuel, weather, and human activity. Weather, fuel and too a lesser extent ignition, are all influenced by climate trends of rising temperatures, increase in the number of hot days, changes in precipitation, electrical storms (often a natural source of ignition), drought, soil moisture and humidity. Even the fact that CO2 aids in plant growth can be a factor, as this can increase fuel load when subject to drier conditions. So are Bushfires caused by climate change? That is a silly question, and a wrong question to ask, as bushfires, like any extreme weather event, have multiple influences. As Hughes points out "All extreme weather events are now being influenced by climate change because they are occurring in a climate system that is hotter and moister than it was 50 years ago (Trenberth 2012)." Numerous scientific studies have found that long term changes in climate increase the bushfire risk, and that is clearly shown in the escalation of the Forest Fire Danger Index (FFDI) and Grass Fire Danger Index (GFDI) over several decades. For South Australia, Lucas et al (2007) found that for Adelaide Total Average Fire Danger Index increased by 14 per cent from 1980-2000 to 2001-2007; Ceduna suffered a 15 per cent increase; Mt Gambier a 3 per cent increase, and Woomera 10 per cent increase. Lucas et al (2005) found that on a broad scale, the number of very high and extreme fire danger days could increase by 4-25% by 2020 and 15-70% by 2050 across much of southeast Australia as a result of projected changes in climate due to increases in greenhouse gases. One of the primary influences on bushfire risk is the prevalence of very hot days. Hughes says, "Very hot, dry and windy days create very high bushfire risk. The most direct link between bushfires and climate change therefore comes from the relationship between the long-term trend towards a warmer climate due to increasing greenhouse gas emissions – the increasing amount of heat in the atmosphere – and the incidence of very hot days. Put simply, climate change is increasing the frequency and severity of very hot days (IPCC 2012; 2013), and is driving up the likelihood of very high fire danger weather." "The latest IPCC report confirms with high confidence that climate change is expected to increase the number of days with very high and extreme fire weather, particularly in southern Australia (IPCC 2014)." "Since the mid-1990s, southeast Australia has experienced a 15 percent decline in late autumn and early winter rainfall and a 25 percent decline in average rainfall in April and May (CSIRO & BoM 2014)." writes Hughes. These drier conditions contribute to increasing the Fire Danger Index and bushfire risk. Weather in South Australia, is also susceptible to changes in the El Niño-Southern Oscillation (ENSO), which has an influence on fire activity and the Forest Fire Danger Index. Hughes argues that there "is a strong positive relationship between El Niño events and fire weather conditions in southeast and central Australia (Williams and Karoly 1999; Verdon et al. 2004; Lucas 2005) and between El Niño events and actual fire activity (Harris et al. 2013)." ENSO weather cycles have changed significantly since the 1970s with cycles being more active and intense during the last 30 years than at any other time in the past 600 years (Aiken et al. 2013). There have been a spate of recent scientific papers and projections suggesting a more active and intense El Niño phase driving drying in the western Pacific Ocean and Australia by mid-to late 21st century. Power et al (2013) found that El Niño is likely to become more intense with climate change, and produce drier conditions for Australia and the Western Pacific, with increases in rainfall in the central and eastern equatorial Pacific in the mid to late twenty first century. McGregor et al (2013) analysed past intensity of El Niño and La Nina events finding that the most recent 30 year period was more active and intense than any time in the last 600 years. Research by Cai et al (2014) showed that global warming is doubling the risk of extreme El Niños. The Bureau of Meteorology have mapped the Winter-Spring rainfall decile ranges for 12 moderate-strong classical El Niños. A rainfall deficit and the likelihood of drought is shown for all of Eastern Australia. Clearly the increase in El Niño activity is likely to increase the incidence of heat and drought in Australia, and increase factors that affect fire activity, but we also are likely to have more severe bushfires influenced by the increase in extreme positive Indian Ocean Dipole (IOD) events. Recent research by Wenju Cai et al (2014) from CSIRO's Marine and Atmosphere Division suggests that an increase in greenhouse gases and climate change is likely to cause more extreme positive Indian Ocean Dipole (IOD) events to occur and that this will likely triple the frequency of bushfires, floods and drought in Australia, Africa and India from one event every 17 years to one every 6 years. Dr Wenju Cai told the ABC: "Most of our severe bushfires were preconditioned by the Indian Ocean Dipole... When a summer season is preceded by an [extreme positive] Indian Ocean Dipole our bushfires tend to be much more severe." Cai et al (2009) found that over half the significant bushfire seasons since 1950 were preceeded by a positive Indian Ocean Dipole event, including South Australia's Ash Wednesday fires in 1983 and Victoria's Black Saturday fires in 2009. While Abbott refuses to discuss the link between climate change and bushfires, his Ministers are attempting to move disaster mitigation to the states, without any acknowledgement of climate change influencing natural disasters. In the middle of this bushfire crisis Federal Minister for Justice Michael Keenan called for a discussion on disaster funding on the ABC current affairs program AM. As most disaster funds are spent on disaster recovery he wants state Government to fund more preventative action. "We have a small amount of money being spent on mitigating the threat of a disaster and the vast majority of the money spent on dealing with the after effects," he said. "Clearly we need to have a conversation with the states [about] whether we can spend that money more effectively to mitigate the effects of a disaster before they occur." he said. Well, yes. But first the climate denial policies at the federal level need to be dropped and replaced by an acceptance that strong mitigation of climate change is essential for reducing long-term disaster expenditure. Without that change you are still dealing with symptoms and not the essential cause. Once climate change is accepted as being an important influence on extreme weather disasters, we can set in place disaster mitigation and adaptation plans that take into account long term climate trends. But strong climate mitigation requires using multiple instruments with a complex set of incentives and disincentives including setting a carbon price or carbontax since abolished by the Abbott Government; large scale business energy efficiency program, also abolished by the Abbott Government; incentives for renewable energy by a stable Renewable Energy Target (RET), which the Abbott government has sought to undermine; and funding of research and development through Australia's premier scientific organisations and universities - also being subject to large funding reductions and restrictions. Then we need adequate funding for adaptation measures and building community resilience to the climate change already built in that will occur due to the great inertia in the system. Australia has warmed by 0.9 degrees according to the latest Bureau of Meteorology annual statement, and even if we were to stop all emissions now, we would be committed to doubling this increase to approaching 2 degrees of warming. To reduce bushfire vulnerability Hughes cites the following strategies, "Current initiatives centre on planning and regulations, building designs to reduce flammability, burying powerlines in high risk areas and retrofitting electricity systems, fuel management, fire detection and suppression, improved early warning systems, and community education (Preston et al. 2009; Buxton et al. 2011; O’Neill and Handmer 2012; King et al. 2013)." Did you note that one of the first actions of the Abbott Government was to axe community climate education through abolition of the Climate Commission in September 2013? With escalation of fire danger risk due to rising temperatures we are going to need employ more proffessional fulltime fire fighters. Hughes writes that "Substantially increased resources for fire suppresson and control will be required. Among these resources are professional firefighters, the number of whom in Australia will need to grow by an estimated 20% (that is, by about 2300) by 2020 (compared to 2012) just to keep pace with increased population and asset growth (NIEIR 2013). When the increased incidence of fire-related extreme weather is also taken into account, the estimate is that a further 1200 fire fighters will be needed." Hughes also points out that due to rising temperatures due to global warming "the increasing length of the fire season will reduce the window of opportunity for hazard reduction at the same time that the need for hazard reduction becomes greater." Emergency management skills in face to face short training courses should be in greater demand, but the Abbott Government slashed funding closing the programs at Mount Macedon's Australian Emergency Management Institute moving the course material online to save $900,00 in the budget. The difficulty with moving the courses online is that emergency services personnel are highly reliant on the trust and support of colleagues. Greater interaction on a face-to face level with both local and interstate colleagues provides both an exchange ideas, plans and networking, building trust and rapport that is much more difficult to do online. Even without factoring in climate change, bushfire damage costs are going to escalate. According to Hughes, "an analyses of projected costs of bushfires in South Australia by Deloitte Access Economics (2014) forecast that bushfires in South Australia could cost $79 million by about mid century (2011$), based only on population and asset increases, but not including increased risk due to climate change." Welcome to a world of lengthening bushfire seasons, and more intense bushfires in South Australia. Unfortunately our Prime Minister and Liberal National Government still have their heads firmly in the sand denying the scientific facts, to everyone's detriment.